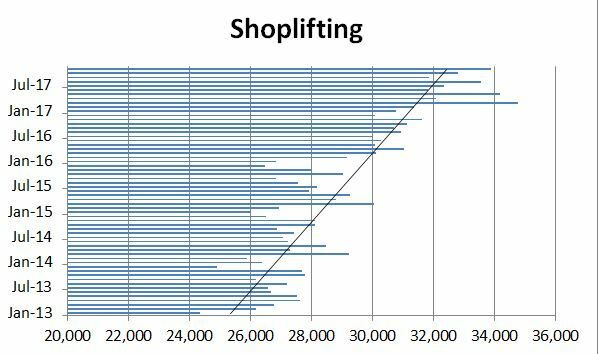 Is shoplifting increasing? Yes – according to the reported data. There were a few stories recently in the media about how Police are now officially not investigating shoplifting of items valued under £200. I fully understand the need for a cut-off point in order to focus on crimes that do greater damage. I just don’t see the need to publicise and legislate for what it is. Discretion ought to be at play here rather than a top-down, one size fits all directive. And there must be other solutions to be explored that could work as well or even better than Police investigations for our shopkeepers. Anyway, I’ve lifted the data from our National Picture page from January 2013 (when our data for Northern Ireland starts) to the latest month November 2017 and added a linear trendline. In percentage terms we are clearly going up, with most of the increase since th the introduction of the Anti-social Behaviour, Crime and Policing Act 2014.